Co-PI, National Center for Complementary and Integrative Health R15AT009612-01, 07/01/17-06/30/20: “Antinociceptive Mechanisms of Spinal Manipulative Therapy for Neuropathic Pain”. Alternative medicine. This new R15 investigates the mechanism of analgesic action of spinal manipulative therapy (SMT), a non-pharmacologic, complementary and integrative health mind and body intervention that is widely used to treat chronic pain. Dr. Onifer’s group has developed an innovative rat model of a frequently used non-thrust SMT technique, low velocity variable amplitude spinal manipulation (LVVA-SM) using a custom-made motorized device. Their preliminary data in a well-characterized rat model of chronic peripheral neuropathic pain (spared nerve injury) indicate that LVVA-SM decreases behavioral signs of chronic pain (hindpaw mechanical allodynia). This applications determines whether LVVA-SM-induced anti-allodynia is mediated by endogenous activation of cannabinoid receptors in the spinal cord dorsal horn. Neuroimmune crosstalk. The central hypothesis of this proposal is that TLQP-21 activation of C3aR1 in dorsal horn of spinal cord establishes and maintains neuropathic pain. The complement 3a receptor (C3aR1) participates in microglial signaling under pathological conditions and was recently shown to be activated by the neuropeptide TLQP-21. Lucy Vulchanova previously demonstrated that TLQP-21 elicits hyperalgesia and contributes to nerve injury-induced hypersensitivity through an unknown mechanism in the spinal cord. In collaboration with her group and with Suzanne Doolen, Dr. Taylor’s lab is using Ca2+ imaging in spinal slices, with a new innovative method to selectively record the activity microglial neurons, to determine whether the cellular target for TLQP-21 C3aR1 on microglia are the. Their results suggest a novel neuroimmune signaling pathway involving TLQP-21-induced activation of microglial C3aR1 that then contributes to spinal neuroplasticity and neuropathic pain. This unique dual-ligand activation of C3aR1 by a neuropeptide (TLQP-21) and an immune mediator (C3a) appears to represent a potential broad-spectrum mechanism throughout the CNS for integration of neuroimmune crosstalk at the molecular level. Suzanne Doolen is leading an effort to scale up funding of this project with an R01 submission in 2017-2018 that will focus on microglial function during neuropathic pain using a novel GCaMP6 imaging approach. Onifer SM, Sozio RS, DiCarlo DM, Li Q, Donahue RR, Taylor BK, Long CR. Spinal manipulative therapy reduces peripheral neuropathic pain in the rat. Neuroreport. 29(3):191-196. (2018) PMID:29381653. Doolen S, Cook J, Riedl M, Kitto K, Kohsaka S, Honda CN, Fairbanks CA, Taylor BK, Vulchanova L. Complement 3a receptor in dorsal horn microglia mediates pronociceptive neuropeptide signaling. 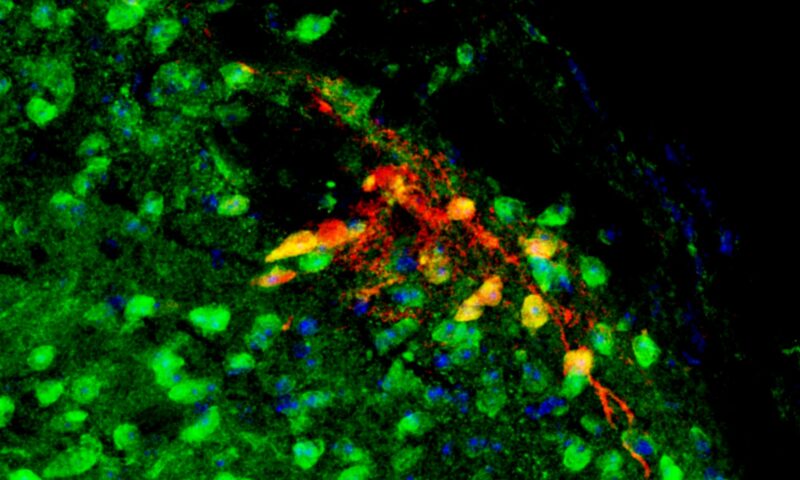 Glia. 65(12):1976-1989 (2017) PMID:28850719.